I didn't notice how this month passed so full it was on everything and especially on cooking. We kept receiving guests and cooking for them, visiting friends and cooking for them, giving cooking classes and doing guess what there... While packing after one of those classes we found a bowl of sliced red onions left uncooked for some reason. Quite a large bowl of crisp red onions, which are now in season. 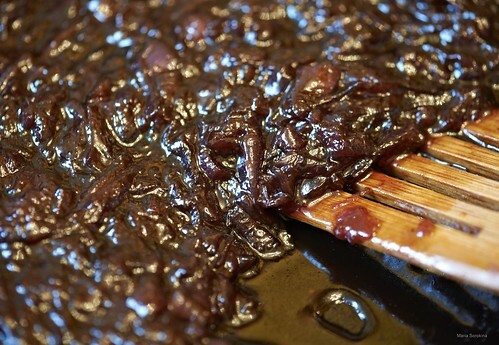 That's how the time came for me to try making French onion marmalade. And I'm so glad I did. 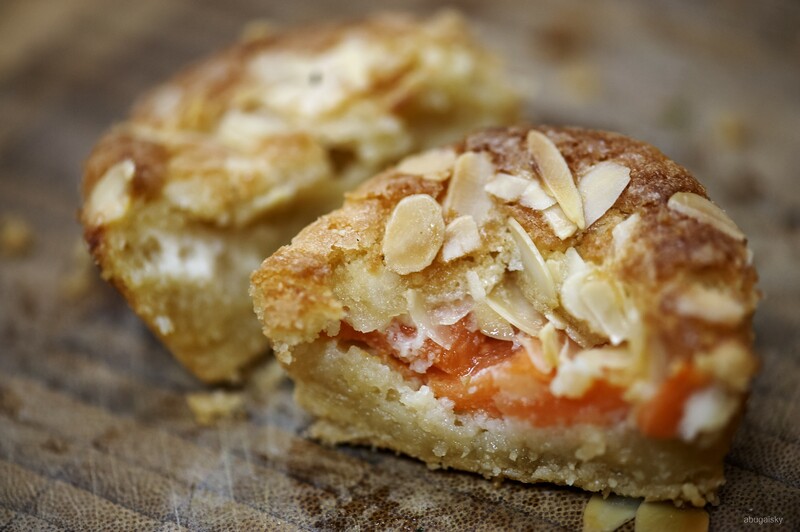 These almond tarts hardly take over half an hour to make because they are crustless. I suddenly found that this way I like them way more that the classic version in short pastry shells. You can use more traditional apples, pears or cherries instead of melon. I never thought about using melon here before a month ago. Turned out that it does a great job here, everybody seems to love the dessert, but I'll better tell you the whole story. That was my first visit to Strudel cafe and quite a happy one. Besides a wide selection of strudels it does offer a full body European menu. I did get quite suspicious at first when I saw Caesar salad and pasta carbonara on their menu as both are trite for Moscow. However as I read further I saw some very tempting options like crispy poached egg with prosciutto and truffle sauce as well as goat cheese creme brule. In reality these two as well as lemon strudel surprised me very pleasantly. I would come back to have them again. As it often happens in Moscow cafes though, not all the dishes on a the menu are created equal, so I'll give more details below so that you can make a safer choice. 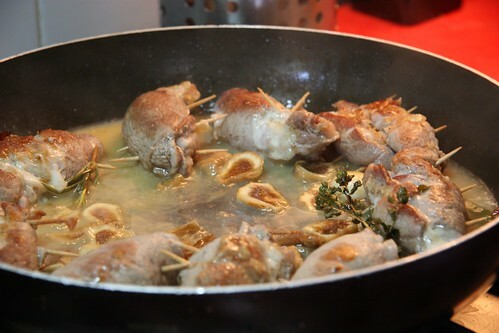 I love lamb overall and this particular way to cook it just became my absolute first choice. I first tried the dish couple of months ago at Hünkar restaurant in Istanbul. 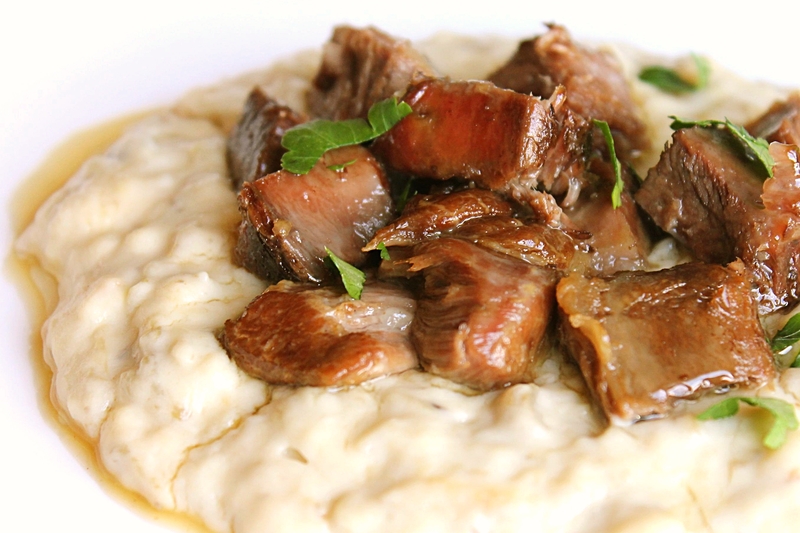 Simple and intense melt in your mouth lamb stew with smoky and creamy eggplant mash made a truly perfect combination. I started researching and it turned out that Hünkar Beğendi was a well known dish. There were many recipes around, but none really resembled the version I had at Hünkar. It took quite some time to replicate it, but finally it worked. Now it seems that at home it comes out even better. I always loved khachapuri, this incredibly Georgian pastry filled with cheese. 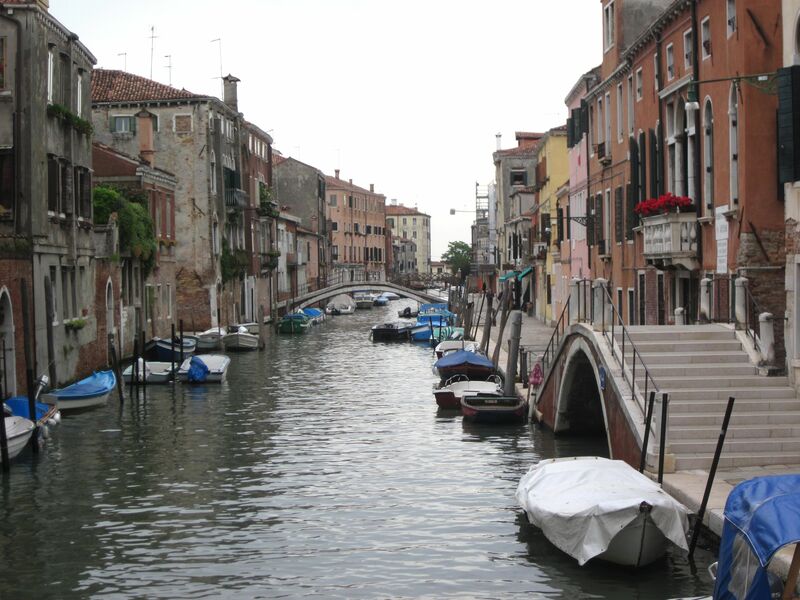 Especially the Adjarian version, which is shaped as a boat and holds a gently cooked egg over the melted cheese. Khachapuri cafe is one of my favorite Georgian places in Moscow and a couple of days ago I got lucky to learn to make khachapuri from their chefs. It turned our absolutely doable at home, which felt like magic. I rarely go into baking yeast cakes or bread, but sometimes there is definitely room for that in life. Exactly like I do enjoy making my own cakes for Christmas, some years I do like baking my own kulichi for Easter. They are not really labor intensive, but they certainly are time consuming. However there are times when spending a thoughtless half a day around the kitchen making something homey the same as times and times before feels just right. Especially given that proper home made kulichi are incredibly good. None of the bought counterparts will ever get close to them. This coming Sunday everybody in Moscow is going to celebrate Easter. I was never religious, but Easter for me is a good old family tradition. And above all it's about food. I do not go into egg decorating affair, which is popular around here, but I have to have kulichi and pascha. Kulichi are special yeast fruit cakes and pascha is a kind of dense cold cheesecake. Together they produce a wonderful festive breakfast. 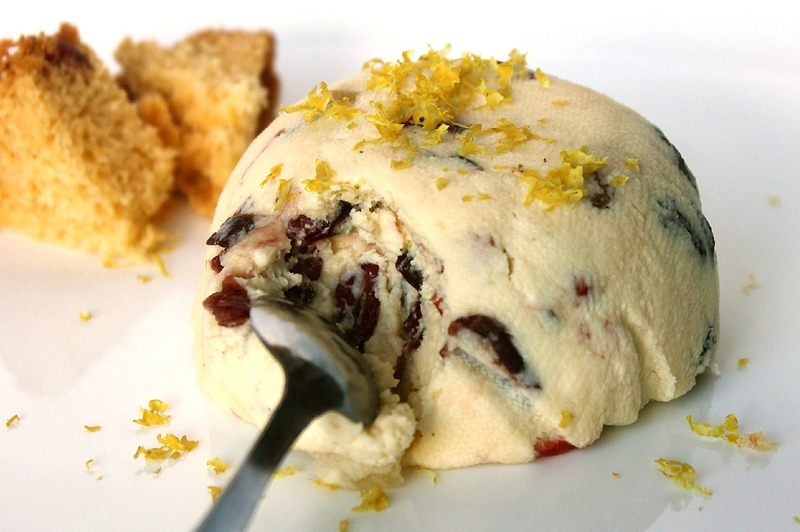 Pascha tastes very fresh and complements the warm soft cake as a delicious spread. I do not bake my own kulichi every year, but pascha I always make myself. I do think it deserves to be made more often than once a year. It only takes half an hour but tastes really special. In Istanbul they told me many times: we are experts in one thousand and one way to cook eggplant. And indeed they are. Eggplant salad on a menu can stand for a dozen different things. One of our dinners included two eggplant starters plus one eggplant side dish and so different all these were that nobody felt overwhelmed by eggplant. However there is much beyond the classics. 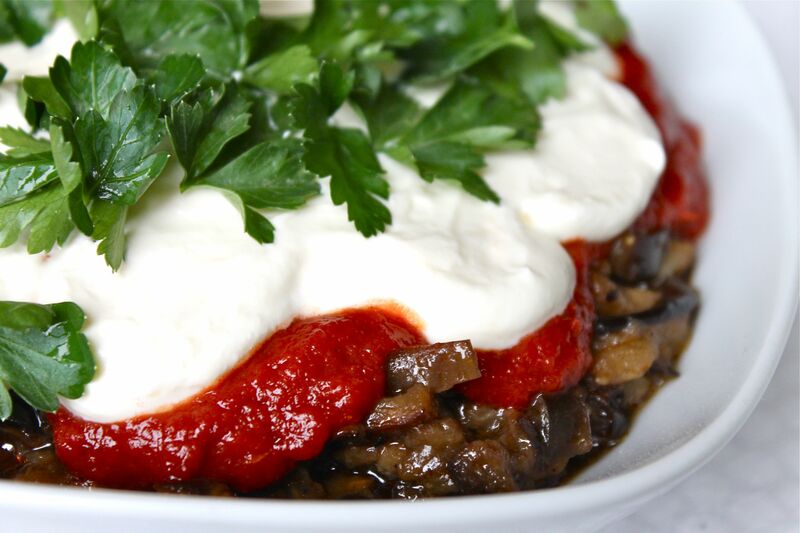 My favorite eggplant starter in Istanbul was a chef's special at Meze by Lemon Tree restaurant - spicy fried eggplant with sweet tomato sauce and creamy yogurt topping. I couldn't trace it in google, but I still found a way to make it. Trial and error method always works if you go on with it long enough.